This was an eat-out weekend, for sure. Our latest: dinner at Rookwood Pottery in Mt Adams. The best stuff there I didn't photograph: an appealing cocktail called Cloud 9 (Gin, Lavendar syrup and violet liqueur), and dessert, which was a sampler of Jeni's ice creams. The entrees were fine, too. 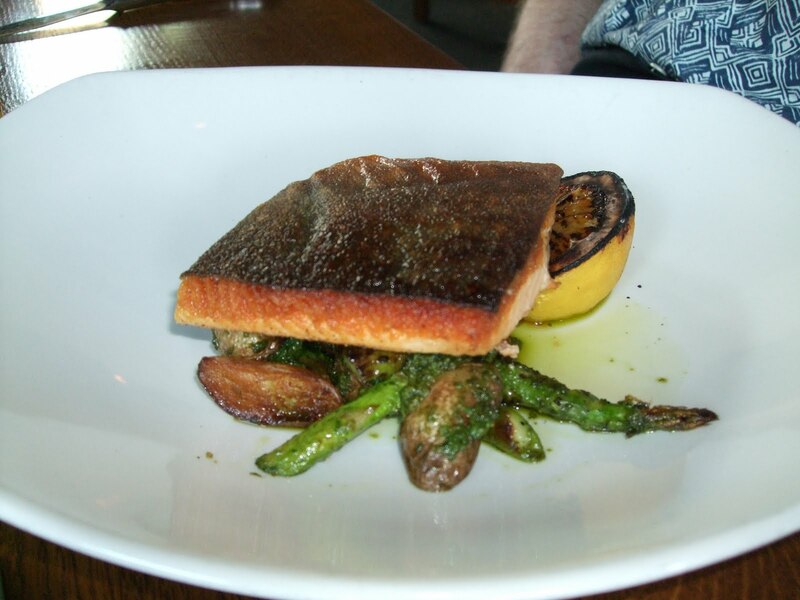 In the photos--artic char, the catch of the day, and roast chicken. Weekend over, back to cooking at home for at least a few days! I didn't really know what to expect at this very popular burger joint. One of my friends said I wouldn't like it because it's too crowded and noisy. She also said that my husband would love it -- crowded and noisy (he calls it "bustle") is right in his wheelhouse. It was his turn to pick our dinner destination, so he insisted we try Terry's Turf Club in an area of eastern Cincinnati called Linwood. 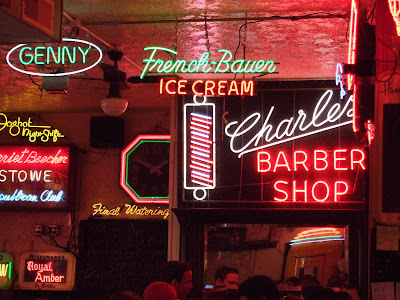 Owner/bartended/chef Terry Campbell says he transformed a former crack house, decorated it with his impressive collection of neon signs (a small sample of which is photographed above) and got serious about making excellent hamburgers. Burgers are not usually on our menu, but we had to give 'em a try. 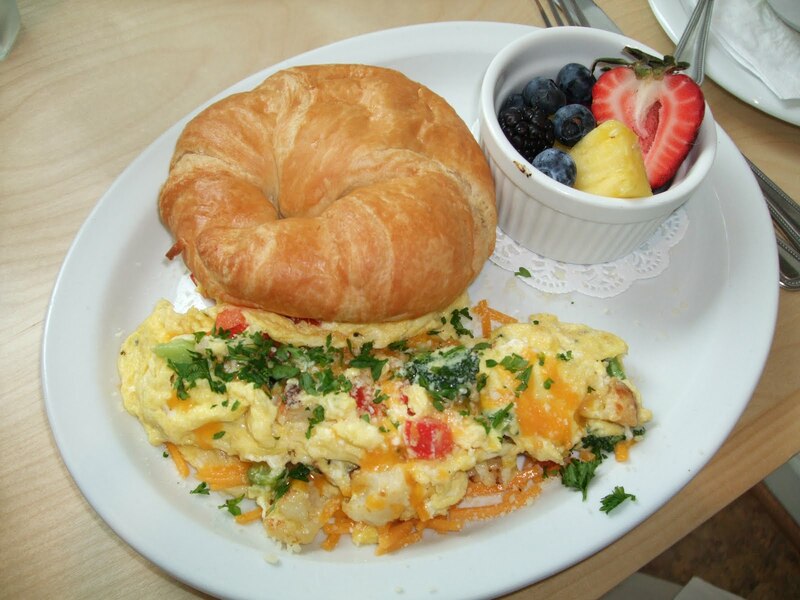 No complaints about their quality or the choices of toppings, including exotic cheeses, that you can add. There are healthier menu options, by the way, so next time I'll branch out. 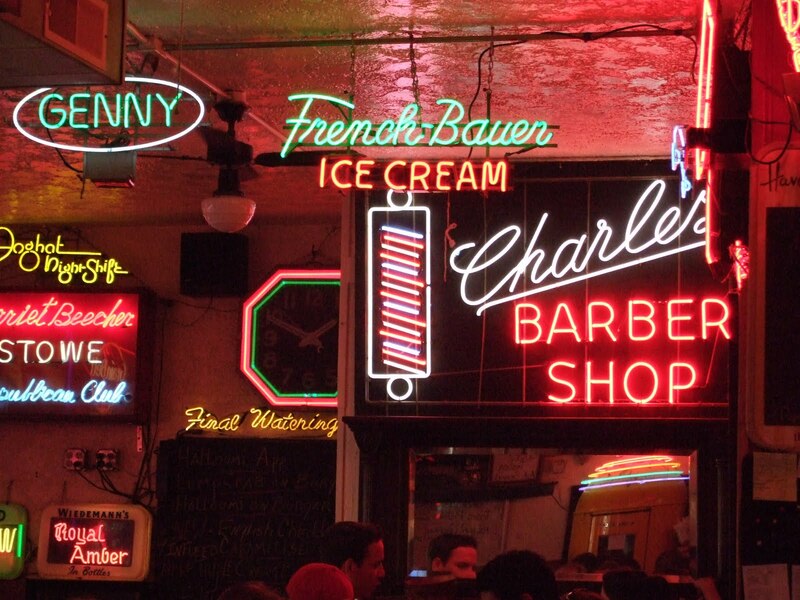 It definitely is a place loaded with bustle, rather warm on a hot night in a single-room eatery with the grills going at full speed all night. There are interesting cocktails, a nice selection of craft beers as well as standard domestic brews, and a modest selection of wines. My husband adored it; I liked it too. Terry is a serious foodie, so it works for me. 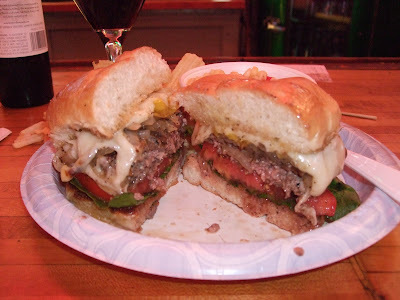 By the way, Terry's will be featured on the Food Network program "Diners, Drive-ins and Dives" Monday 5/31 at 10 PM. Here are a few shots from dinner at Local 127, the locavore-friendly, farm to table restaurant in downtown Cincinnati. The spot used to house Jean-Robert at Pigalle's. 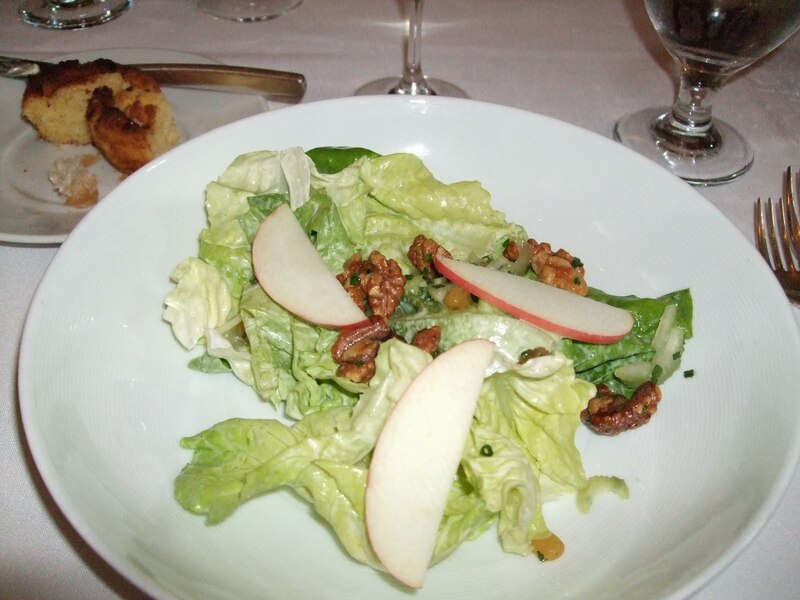 The Waldorf Salad (top) was outstanding. Most such salads are heavy with mayo and totally unappealing. This used local bibb lettuce and crispy sliced apples; the best part though were the delicious toasted walnuts. A standout. 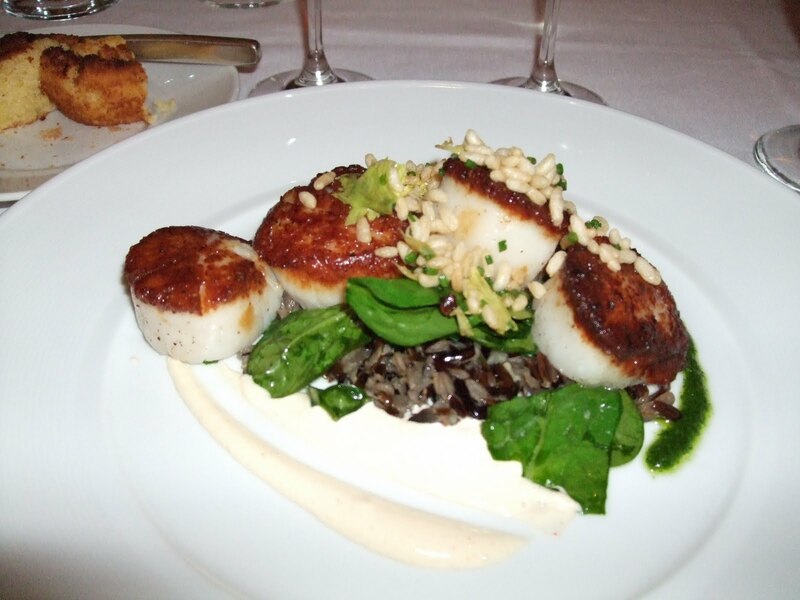 Finally, my scallops entree is the bottom photo. It was a retirement dinner for a fellow professor -- a political science colleague of my husband's -- and the meal definitely was a hit with all. Layered salads are fun to make, they look pretty, and they tend to stay fresh a long time because the dressing isn't tossed with the other ingredients -- it's spooned on top. A little of the dressing will seep into the other layers, but it's not going to get soggy. 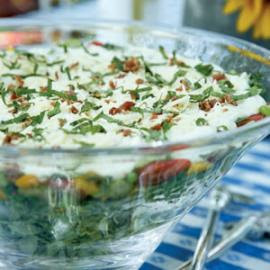 Of course, many layered salads are not very healthy because there's too many calories and too much fat in the dressing. Here's a lighter version that I think is just as yummy as any other. It's from the trusty Eating Well magazine. Place lettuce in a large bowl, preferably a glass or clear plastic one. Layer peas, bell peppers, tomatoes, celery and scallion on top. Whisk together the next seven ingredients (yogurt through pepper) in a separate bowl until smooth. Spread the dressing evenly over the salad. Sprinkle with the cheese, basil and bacon. Cover and chill for 30 minutes, or serve at room temperature. Wow, did this turn out fabulous. I'm not going to call it risotto because I didn't use the tedious technique of constant stirring to absorb the liquid, bit by bit. There's no way it could have tasted better if I had, by the way. 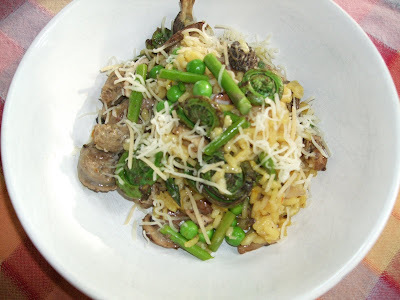 The inspiration behind this creation was my coming into possession of a few rare, fine seasonal ingredients, especially fiddlehead ferns, morel mushrooms and fresh peas -- all from local sources and purchased at Findlay Market last weekend. I added a little bit of lamb sausage for flavor, a small amount of local asparagus, and a few seasonings including a pinch of that magic ingredient, saffron. I cooked the rice with only a bit of shallot and garlic and used chicken stock for the liquid. A couple of minutes before all the liquid was absorbed, I added the peas so they could steam. 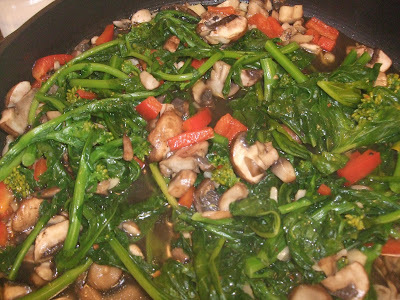 In a separate pan, I sauteed the mushrooms, ferns and asparagus, mixing that in with the rice at the last minute. If you don't have all these ingredients, do not despair. You can substitute portabella or button mushrooms for the morels -- in fact, I used some portabella with the morels because I had only a tiny amount of the latter. Fiddlehead ferns are almost impossible to find, so just omit them unless you have a source. Substitute another kind of sausage for the lamb, if necessary, or drop it entirely and use vegetable stock instead of chicken to make the dish vegetarian. 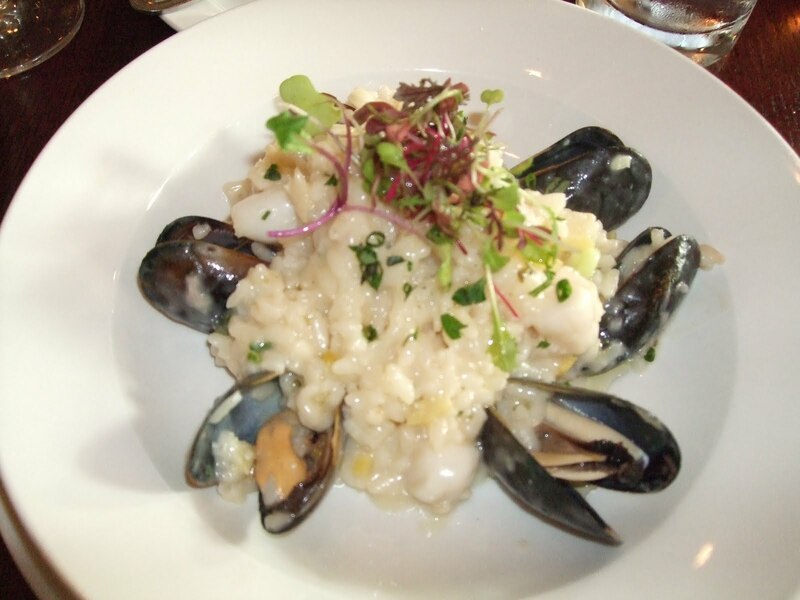 It's a one-dish meal, but you might also serve a salad and crusty bread. Heat oil in a large skillet over medium heat. Add shallots and garlic and stir-fry for 2-3 minutes. Add rice and stir to coat the rice well with the oil. Add stock one cup at a time, stirring, and bringing the mixture to a low boil before you add more liquid. When all the stock is added and the mixture has returned to a boil, add saffron, salt and pepper, cover and reduce heat to low. The rice will take about 18-20 minutes to be completely done. Meanwhile, in a smaller skillet, cook the sausage until it browns, about 3-4 minutes on medium high heat. Drain excess oil, remove sausage to a plate and wipe the pan until just a thin coating of grease remains. Add vegetables and saute over medium heat, adding liquid as needed for some moisture, stirring constantly. Season with salt and pepper and reduce heat to low. Uncover rice about 5 minutes before it's done and gently stir in the peas. Cover again. When rice is done (taste it), stir in vegetable mixture. Remove from heat and add cheese. Spoon into bowls, adjust seasonings (add more salt and/or pepper if needed), and pass more cheese at the table. It may sound complicated but it is SO worth it; everyone in your family will moan with pleasure and lick the plate. Seriously. The current (June) issue of Bon Appetit included this marvelous recipe that uses several adored ingredients. Arugula is available now at many farmers' markets -- it's a cooler-weather green. You can still find fresh fennel, even though its peak season is earlier in the year. And fresh apricots are just starting to get good. Instructions: Whisk together vinegar, shallot and olive oil. 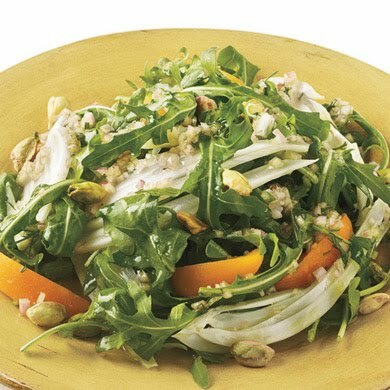 Place arugula, fennel and apricots in a large bowl and toss with the dressing. Sprinkle with nuts, and serve. 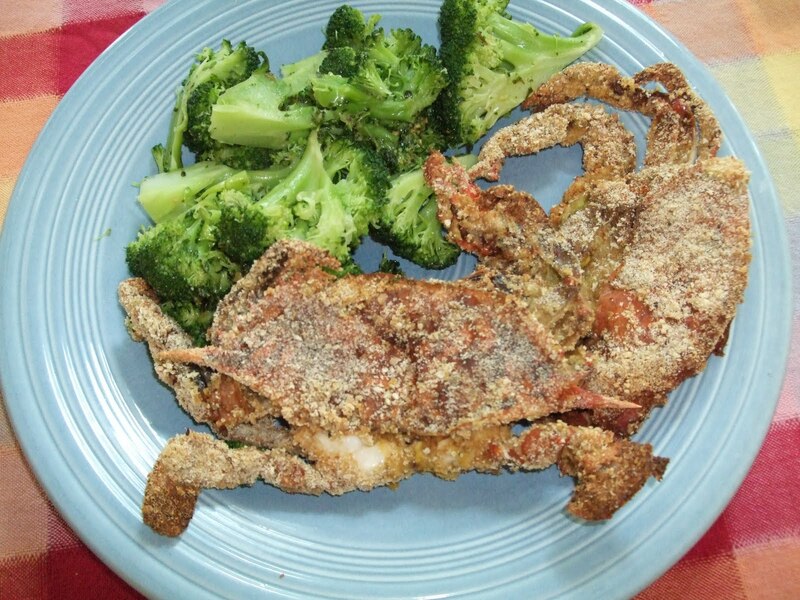 Soft-shelled crabs are showing up at the better fish markets these days -- at least around here, it's a short-lived season that starts in May and could be over before July. But these little critters might grace seafood-oriented menus for a few months, especially along the east coast of the U.S. I scored some last weekend and wanted to see if I could prepare them with fewer calories than they simply must have when heavily breaded and fried (probably in butter) at restaurants. So I dipped the crabs in a simple egg bath then dredged them in a bread crumb mixture seasoned with salt, pepper, lemon peel and a little garlic. Shaking loose any extra bread crumbs, I placed them on a baking sheet coated with cooking spray, and baked them in a 400-degree preheated oven for about 10 minutes. We added squirts of fresh lemon at the table and went sauceless. 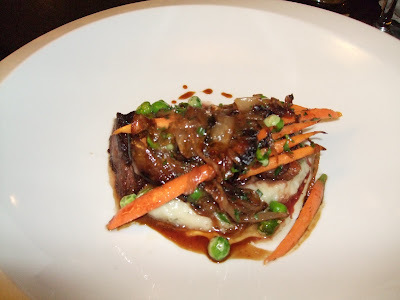 We had wine-loving friends over for dinner Saturday night and wanted to serve a main course that would do justice to some good red wine from our cellar. Problem is, we don't eat red meat except very occasionally, and cooking it is not within my repertoire. One exception, though, is bison (a.k.a. buffalo). It's farmed locally at a ranch called Vista Grand, whose products are sold at Eckerlin's at Findlay Market, among other area groceries. Eckerlin's sells fresh ground bison and other cuts of bison, such as steaks, frozen. 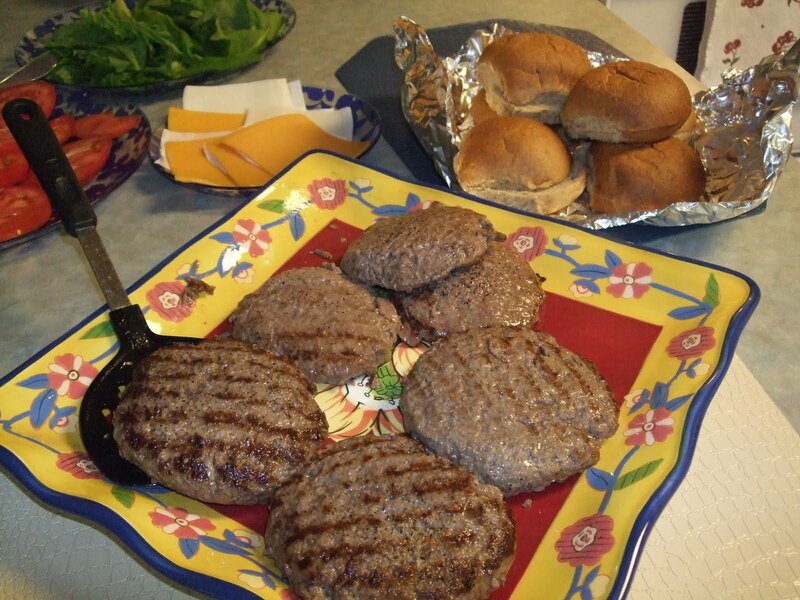 The meat has significantly lower fat content than beef. Our guests, most of whom had not tried bison burgers, said they could not tell the difference, taste wise. With all the trimmings -- local lettuces, hot house tomatoes and sliced cheese -- it went beautifully with a red Bordeaux and a bottle of 2001 Burnet Ridge Purple Trillium. Ground bison is perfect in soups, stews and sauces, too. My bison chili with a secret ingredient -- a bottle of very dark beer -- is one of the most popular recipes I've ever posted on this blog. I'll post it again when the weather cools off and we're wanting chili again. Meanwhile though, let's enjoy summer. This is Cincinnati's premier farmer's market, just hitting its stride for the 2010 growing season. Here are a few of the wonderful foods and flowers that our local growers are bringing to market. Strawberries, shell peas, spinach, lettuces of all kinds and asparagus are among the most delicious offerings this week, and most likely for at least a few weeks to come. If you're reading this from another part of the planet, I hope you're able to find and enjoy the bounty of the land, too. This Mt Lookout Square breakfast and lunch spot has fewer than a dozen tables indoors and couple on the sidewalk. 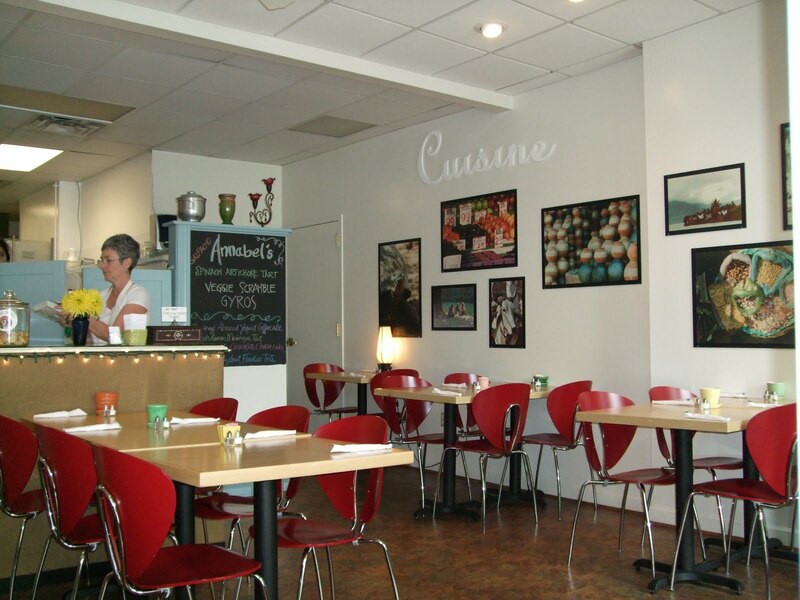 Owner Annabel does all the shopping, food prep and cooking, and she has one server to help. We had lunch there today but opted for items from the breakfast-all-day menu. My cornmeal-enhanced pancakes were tasty, and my friend said her veggie scramble was the best eggs she's eaten in a long time. Worth a visit if you're in the 'hood. Annabel is at left in the interior shot. 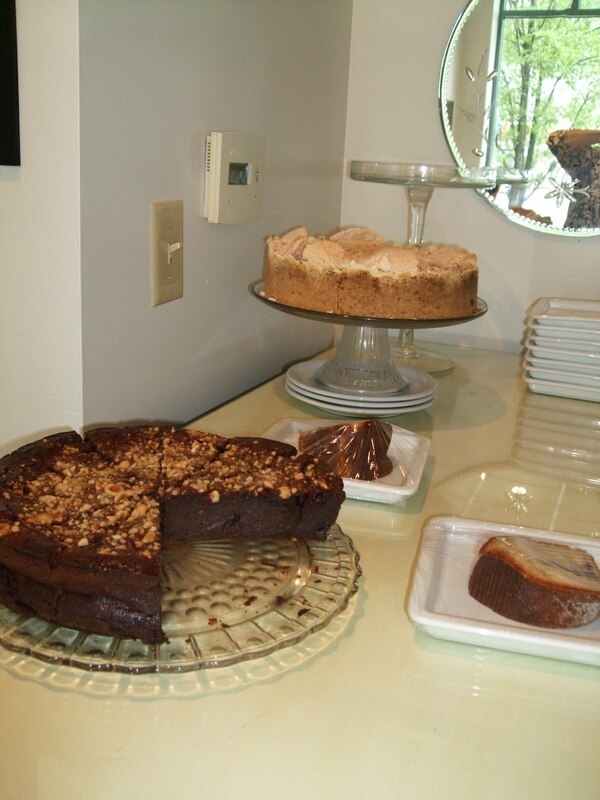 I've also included the egg dish and their sweets display. How I would love to spend a week at Rancho la Puerta in Baja California. My friend went with her pals years ago and came back refreshed, invigorated and raving about the experience. It's on my bucket list! But while I wait, I found this article in Epicurious with recipes from a selection of international spas, including La Puerta, that specialize in gourmet health food. Check out Cucumber Gazpacho with Shrimp and Melon from Rendezvous Bay, or Garden Beet Soup (above) from Rancho La Puerta. This photo epitomizes a typical dinner at our house -- some kind of fish and a couple of veggies. 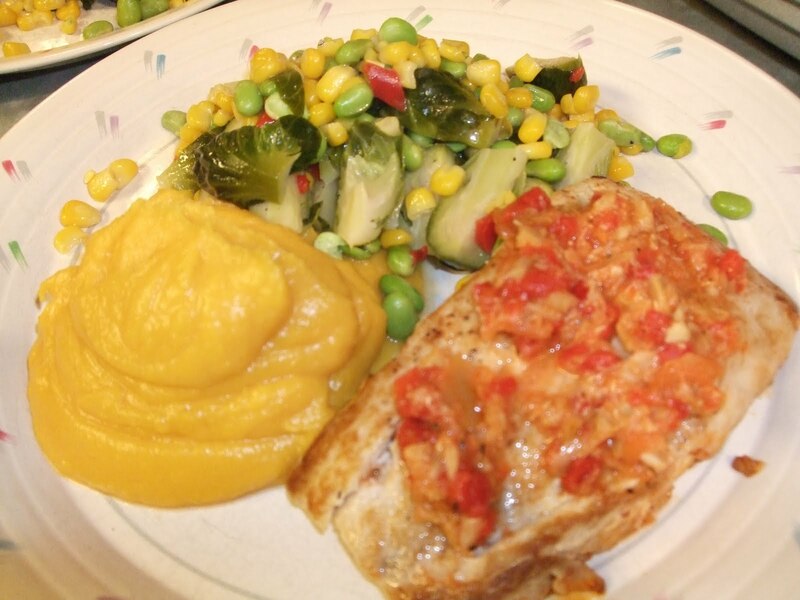 In this case, the fish is grouper, sauteed with an artichoke and pepper sauce, with a side of Brussels sprouts topped with the same sauce. What fills out the plate, though, is a side dish that always wins raves from family and guests. It's just butternut squash pureed with spices, a little fat and a little milk. I usually add a touch of honey or maple syrup, as well. It's so easy to buy pre-peeled and cut squash nowadays. Simply cut the squash pieces into relatively equal sizes and steam until very tender. Transfer the cooked squash to a food processor and add your seasonings. I'll put a little margarine, milk, salt & pepper and something sweet, along with whatever spices I feel like adding. Cumin, cinnamon, nutmeg, ginger, turmeric, cayenne pepper are all possibilities--or any combination thereof. Puree until smooth and serve with dinner. 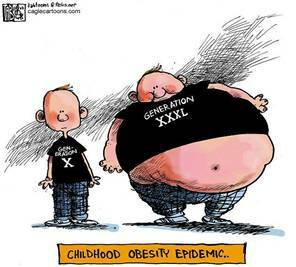 A pledge to combat childhood obesity -- is it for real? It's all over the news today -- that an alliance of food manufacturers have agreed to introduce healthier foods, cut calories in existing products, and generally behave like responsible partners in Michele Obama's high-profile campaign against childhood obesity. The Healthy Weight Commitment Foundation, a coalition including Campbell Soup, Coca-Cola, General Mills, Kellogg, Kraft Foods and PepsiCo, will slash 1 trillion calories by the end of 2012 and 1.5 trillion calories by the end of 2015. The 16 members make 20-25 percent of food consumed in the United States. "This is precisely the kind of real private-sector commitment that we need. And I hope that more will follow the example that they've set," Obama said at a news conference at the Eisenhower Executive Office Building. Some public-health advocates questioned the industry's motives, saying the growing awareness about obesity has increased demand for more healthful products. "My guess is that they were going to do this anyway," said Kelly Brownell, director of the Rudd Center for Food Policy and Obesity at Yale University. "The hidden motive here is to convince government to back off and not regulate the industry." It's strawberry season, and the especially good news is that the delicious red berries are having a prolific year. Apparently the crops in Florida and California have been so big this spring that prices are very low. That's why you're likely to see great sales on strawberries just about every week. Of course, berries grown and harvested closer to home are going to be tastier. They're picked much closer to ripeness because they don't have to withstand all that shipping and still arrive looking appealing. Here in our market, I've only seen a couple of growers at Findlay Market who's had them yet this spring, but that's about to change. 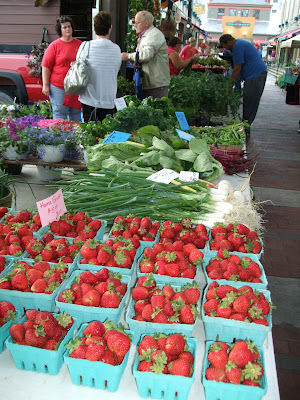 You should be finding local strawberries all around the area very soon. Here's a short piece my healthy foodie colleague, Mary Ann Barnes, wrote for our column in Whole Living Journal last spring. Try this salad as a way to enjoy them. Combine arugula, strawberries and nuts in a large bowl and add dressing, tossing to coat arugula. 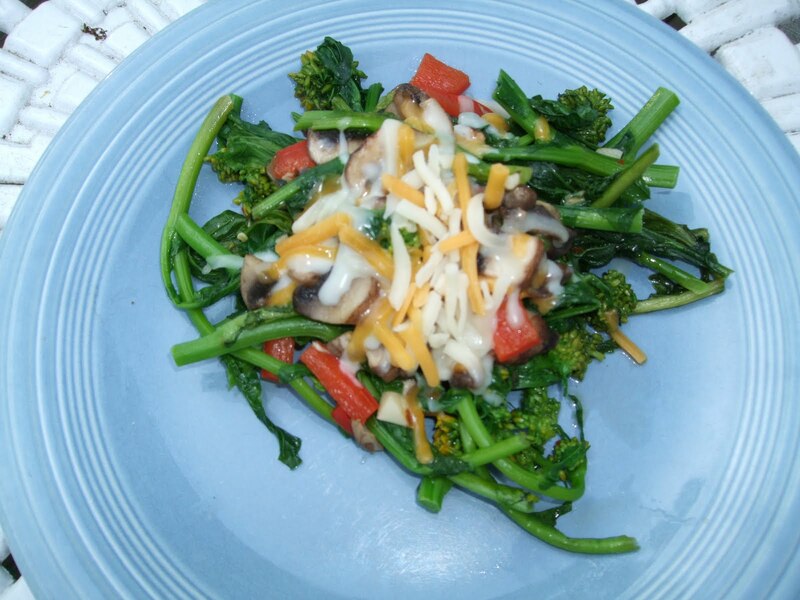 Divide into salad bowls or plates, sprinkle with cheese and serve. This Mt. Lookout gem of a restaurant deserves local foodies' support. 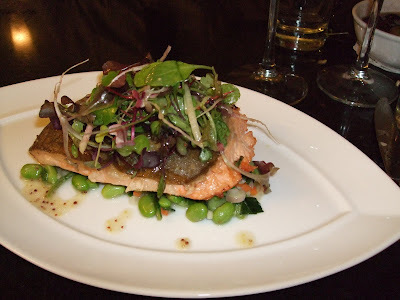 Alas, I don't get over that way very often, but made it for dinner at Nectar with friends Saturday night. 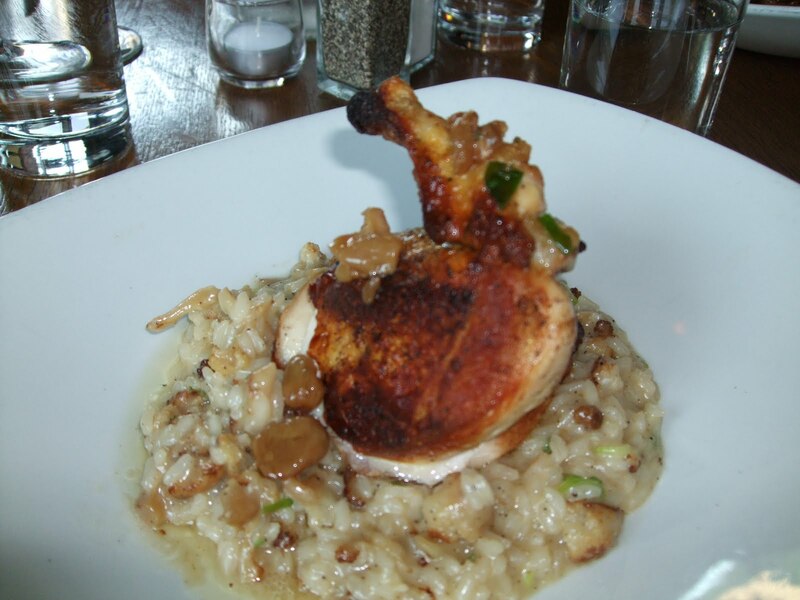 Chef/Owner Julie Francis is a true locavore who lists the provenance of many dishes and ingredients. 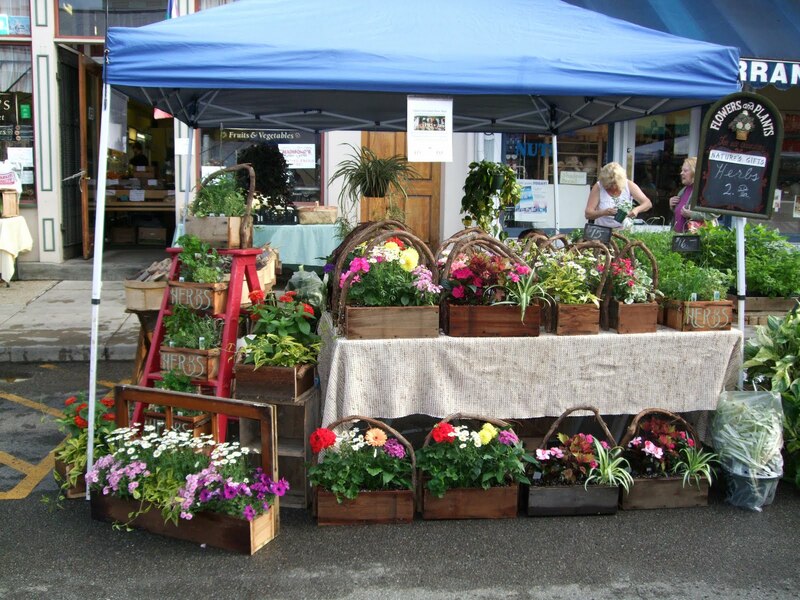 She selects locally grown, produced and/or created foods whenever possible. She's well known among many of the farmers and other purveyors of Ohio, Kentucky and Indiana foods who sell at Findlay Market. We had a light supper, with wine, that included the dishes above. 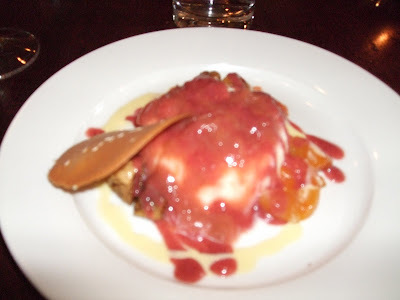 At top is a Mediterranean sampler appetizer, followed by a delicious risotto (with mussels and clams, among other ingredients) and dessert of panna cotta topped with poached spring fruits -- strawberry and rhubarb, mostly. 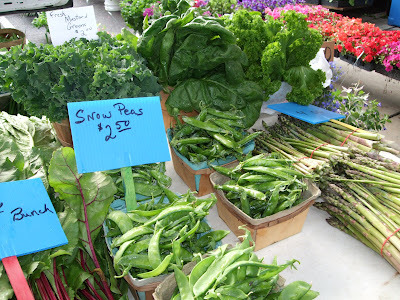 This vegetable is still in season -- I got a lovely bunch at Bigg's just the other day. If you think this Italian green is too bitter, the secret to making it less so is to blanch the chopped greens in boiling salted water for 3-4 minutes, drain, and then add to your saute pan with other ingredients. 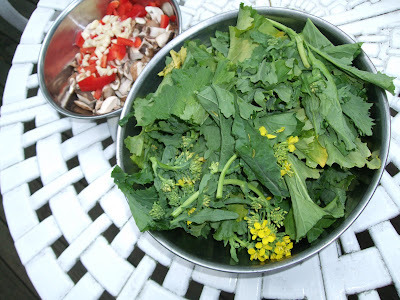 The photos show: Raw bunch of rapini, with those darling little broccoli flowers; Chopped rapini in one bowl (before blanching) and chopped mushrooms, red pepper, garlic and onion in another; The dish combined in the pan; The finished product, sprinkled with cheddar and mozzarella cheese. After draining the greens, add them to a large skillet in which you have sauteed whatever other veggies you would like to add. I didn't have any on hand, but chopped fennel would have been a delicious partner, and chopped leeks would be swell, too. Add some vegetable or chicken broth (about a cup), salt and pepper and a little crushed red pepper flakes. In addition to topping with cheese, you also can add toasted pine nuts or other nuts. I love this stuff! None of our senses are more important than vision, and lifestyle choices affect the health of our eyes no less than the rest of our body. A diet rich in antioxidants protects eyes not only against age-related macular degeneration but also from damaging sun exposure. Eating Well magazine lists seven foods for better vision, with links to yummy recipes using these ingredients. Click through to read more! Can What You Eat Reverse Vision Loss? I've been using plain yogurt lately as a substitute for cream in pasta sauces and find it really likable. The tangy flavor makes it more like sour cream than sweet cream, but in a vegetable-based pasta dish that works well. I made the following recipe without meat or shrimp, but it would be easy to add extra protein -- including some kind of beans or edamame -- if you wanted. 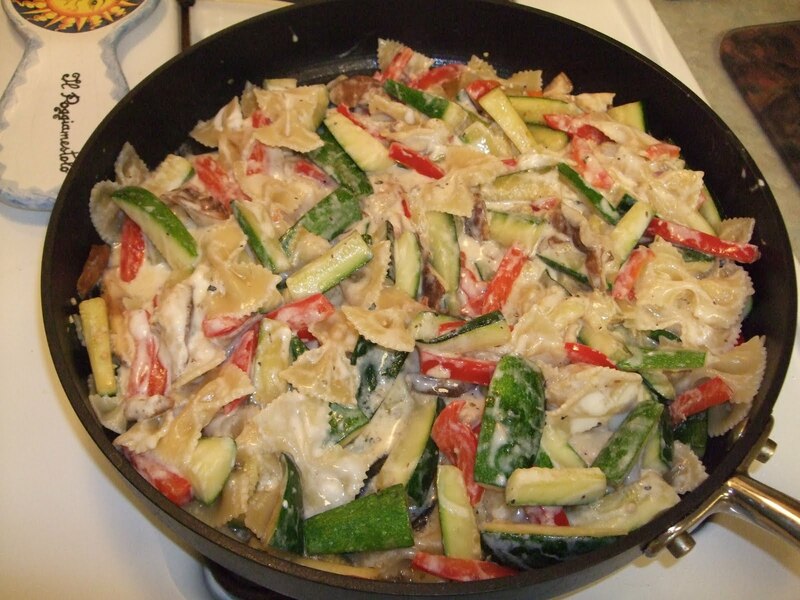 Photos show various steps: stir-frying the vegetables; after the pasta and yogurt are added to the pan; and the finished dish. Heat oil in a large skillet over medium-high heat. Add next five ingredients (pepper through shallots) and stir-fry for 5 minutes, until vegetables begin to tenderize and brown. Add salt and pepper and reduce heat to medium. Stir in oregano, lemon juice and shrimp or chicken, if using. Cover and cook for another 2 minutes to heat thoroughly. Remove pan from heat and add reserved pasta, stirring well. Stir in yogurt and one cup of cheese. Divide into serving dishes or bowls, sprinkle with nuts and pass extra cheese at the table. 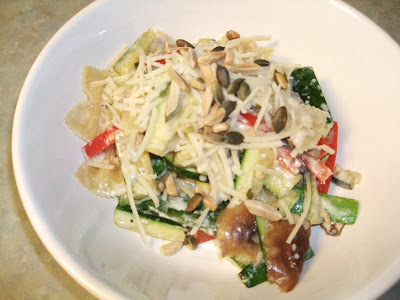 Here's another way to enjoy one of my very favorite flavors -- fresh fennel bulb. 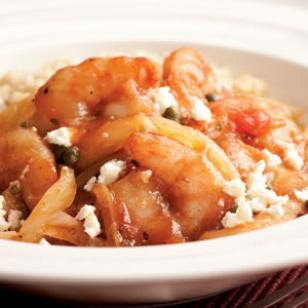 Sauteed with tender shrimp and tangy tomatoes, topped off by salty capers, this quick-cooking meal works over rice, pasta or any other whole grain such as couscous or quinoa. 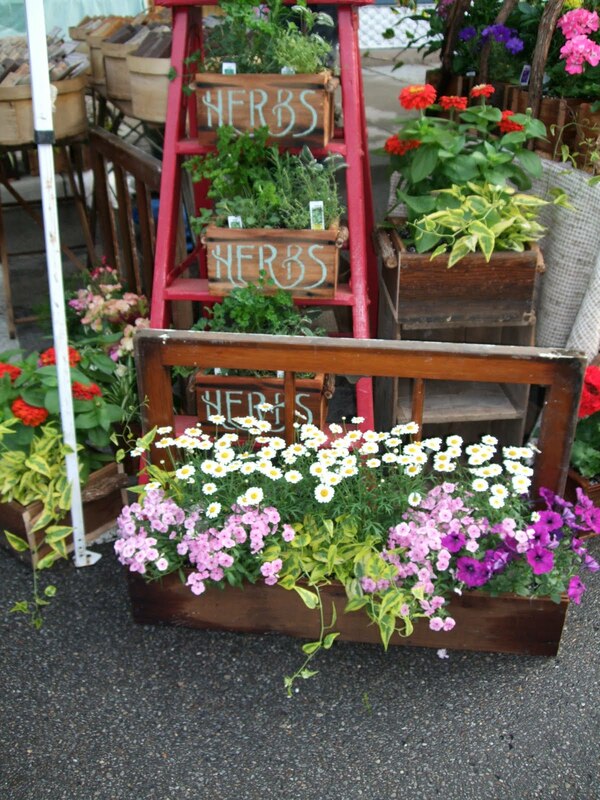 Feel free to experiment with the fresh herbs, using whatever you have on hand. You can also substitute half as much dried herbs, if necessary. Heat oil in a large skillet over medium-high heat. Add fennel and cook, stirring, until fennel wilts and starts to brown (about 5-6 minutes). Add tomatoes and herbs, stirring well and scraping any browned bits into the mixture. Reduce heat to medium-low, add the shrimp and saute, stirring constantly, until the shrimp turns pink and is just cooked, about 4 minutes. Stir in capers and seasonings, remove to plates or a serving dish and sprinkle with the cheese, if using. Eating more slowly can make a whale of a difference in staying slim, because the faster we eat, the more likely we are to overeat. To avoid eating too much -- and earning a bigger pants size -- try this mealtime trick: Spend at least 30 minutes enjoying your food. Research shows that scarfing down food as if every meal were your last actually reduces levels of key appetite-controlling hormones -- the ones that normally keep you feeling full and satisfied and tell you when to put down that fork. In the study, lucky volunteers were served about 2 1/2 scoops of ice cream -- twice. On one day, they wolfed down the treat in 5 minutes flat. Then, on another day, they lingered over the bowl for a full half hour. Blood tests showed that slow eating increased levels of two appetite-lowering chemicals (peptide YY and glucagon-like peptide-1) by 25 to 30 percent. And these satisfaction hormones stayed high for the next 2 1/2 hours. Veggie-cize your meals. Adding veggies adds bulk but few calories. Watch this video to find out how generous portions of delicious vegetables let you eat more but weigh less. Focus on your food. Paying attention to every bit helps you eat less. Here's how to use mindful eating and make the most of every mouthful. 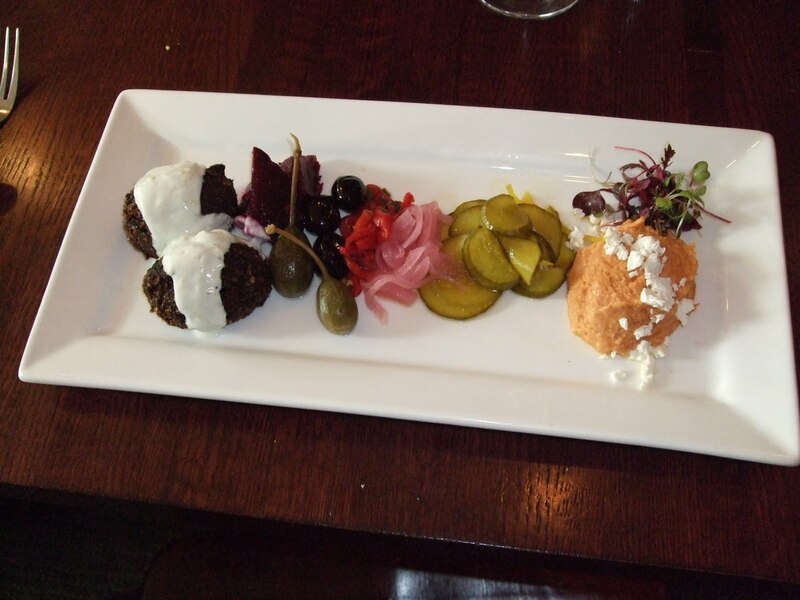 Treat yourself to an appetizer. 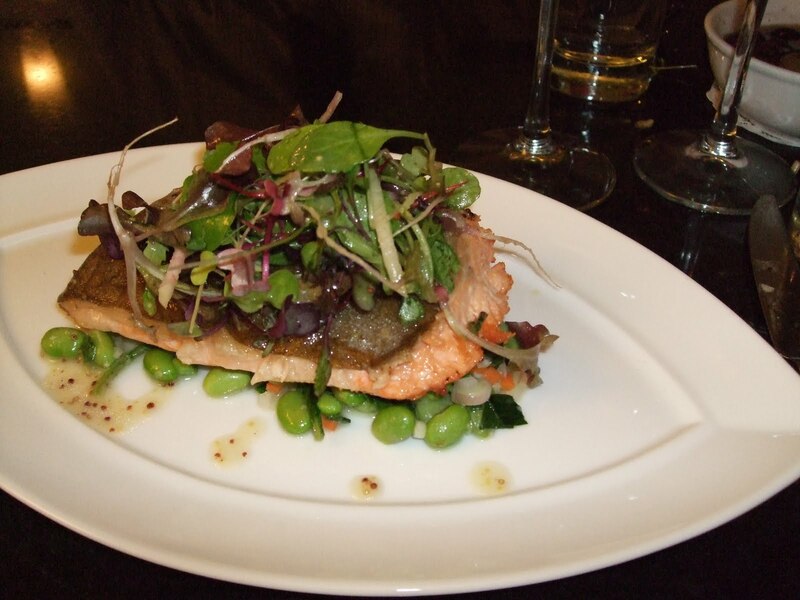 A healthy pre-meal nosh helps turn hunger off. There's a tiny restaurant in Clifton Heights called Tea and Bowl , a rather odd name for a Chinese restaurant with a specialty in all kinds of bubble tea. I'd seen bubble tea here and there but hadn't tried it until today, when my brother and I popped in for lunch. The menu lists dozens of variations and flavors of five basic styles, all of which share the "bubbles," marble-size pieces of tapioca that line the bottom of the glass. The five styles are basic, flavored cold tea; the same but made with milk; blended versions with ice, called "snow"; and hot tea and milk. Actually, that sounds complicated, and it is rather hard to describe. 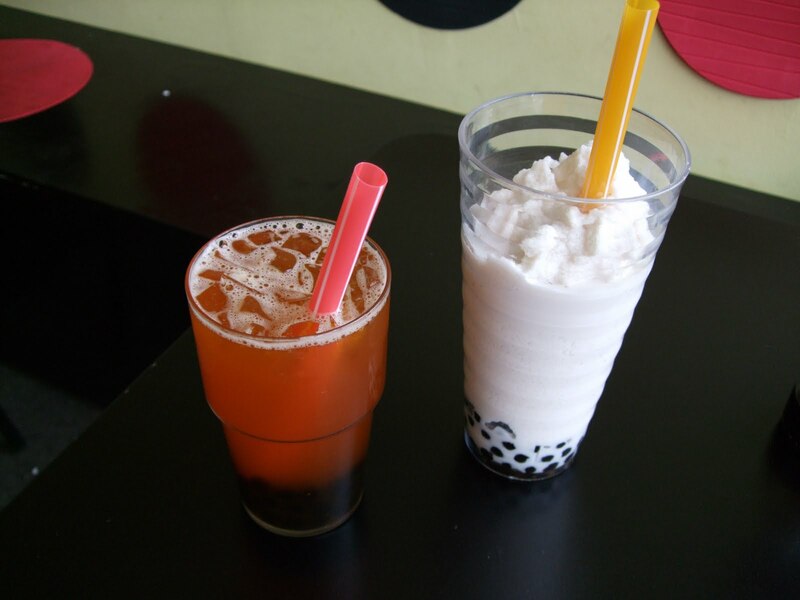 I tried the mango tea, no milk, pictured at left, while my brother had the almond snow. We liked both but especially his snow. There's probably too much sugar in these drinks to make them a healthy choice, but our server did say she could make them without sugar. 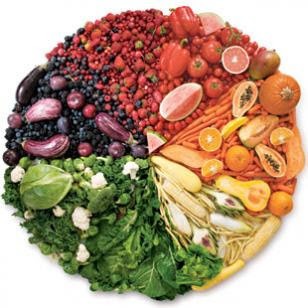 From the reliable Eating Well magazine, check out their "color wheel" way of eating for optimum health -- and enjoyment. Click here for more info. What’s fascinating is that nature seems to have a way of highlighting these beneficial nutrients by giving them bright colors that allow you to spot them at a glance. 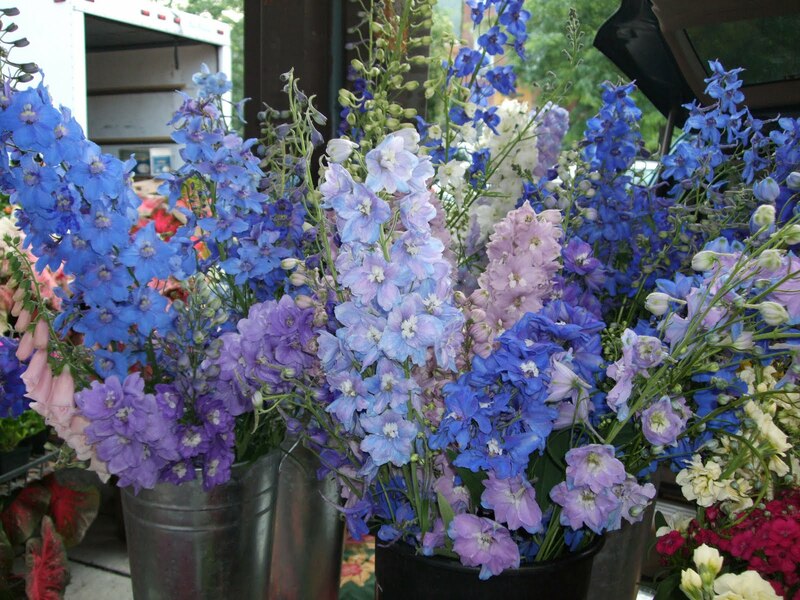 For example, anthocyanins make blueberries blue and may help to keep your mind sharp. Tomatoes get their ruby hue from lycopene, a phytochemical that may help to prevent prostate cancer. To get the maximum disease-fighting power that phytochemicals can provide, choose foods that represent all colors of the rainbow. The USDA suggests paying particular attention to orange (2 cups per week) and dark green (3 cups per week) produce, both good sources of vitamin A and other important nutrients. Use our vibrant color wheel to inspire you. Gingerbread is not just for the holidays. A spicy cake with cream cheese frosting is good just about anytime. Here is a healthier version than usual. Save this recipe for your holiday baking, too -- it's a real standby around here. 1. Preheat oven to 350 degrees. Coat 8 inch square pan with cooking spray. 2. Beat sugar and spread in mixing bowl for 2 minutes. Add molasses and egg substitute. Beat well. 3. Combine dry ingredients in a medium bowl. Add flour mixture, alternating with buttermilk (and applesauce), to sugar mixture. Stir in vanilla. 4. Spoon into prepared pan and bake for 30 minutes, or until wooden toothpick comes out clean. Cool completely on a wire rack. Note: Use cream cheese icing for the cake. Garnish with candied ginger, if desired. Top each piece with lemon curd (if desired) when serving. The Healthy Foodie loves cauliflower! While it can be boring all by itself, cauliflower’s versatility and nutty texture--when cooked properly—make it a staple in our kitchen. 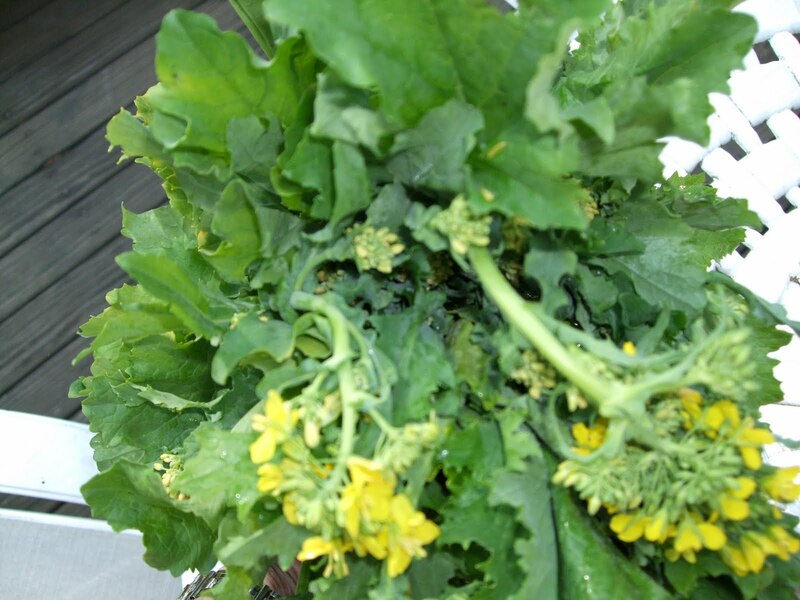 Along with broccoli and cabbage, it is one of the most healthful veggies in the market, and you can get it year-round. But over the next couple of months, you may be able to find fresh, locally raised cauliflower at your farmers' markets. 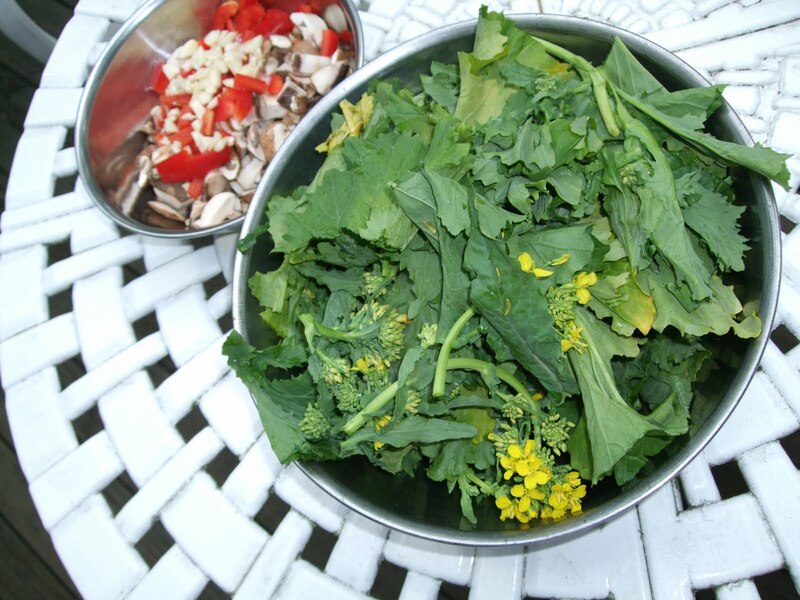 You can substitute the broccoli/cauliflower hybrid “broco-flower,” if you like, in this vegan recipe. Serve with brown rice and perhaps a slice of nan bread. Vout is the relatively new enterprise sharing the space of the more upscale Slim's, on Hamilton Avenue in the center of Northside's attractive and eclectic dining scene. On Fridays and Saturdays, the restaurant reverts to the fixed-price, four-course inventive (but still casual) menu of Slim's. But Tuesday through Thursday, it's another concept altogether. Prices are very low -- $7.50 - $8 for entrees, $5 or so for salads, appetizers in the same range as the salads -- and as with Slim's it's BYO liquor, including beer. 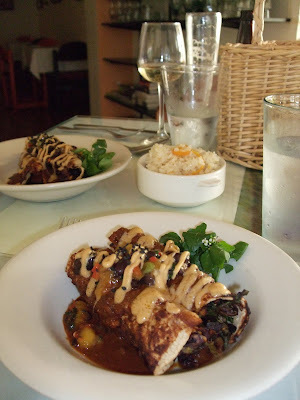 We both had the vegetarian enchiladas and shared a side of rice with kumquats; my starter was a watercress salad with dried figs and blue cheese, and hubby had a chicken and veggie soup. With the beer and wine we brought along, we got out of there for about $30. We will return to try some of the other Latin-flavored dishes. I think most people would greet with dismay the newest "conventional wisdom" about how much exercise we need each day to keep from getting fatter as we age. For a normal weight woman to avoid middle-age spread, she needs 60 minutes every day of moderate cardio-type exercise. If you start your journey into middle age with a few extra pounds, you'll have to diet it off as well as do even more daily exercise. Here's what the Real Age doctors say about these findings, along with links about how to make this daunting task easier. In a long-term study, middle-aged women who averaged about 60 minutes' worth of moderate-intensity exercise like walking on a daily basis experienced almost no weight gain during a 13-year period. If you struggle with your weight already, you might need a little more than a daily 60. The overweight or obese women in the study weren't able to halt weight gain with the same level of exercise that worked for their healthy-weight peers. For a truly effective weight loss plan, try our online version of the best-selling book YOU: On a Diet. This online version combines daily walking with an easy-to-follow, proven-to-work eating plan that has helped hundreds of RealAge members lose weight. Find out more with this quick 99-second version of the diet. No time? Here's the exercise advice the RealAge docs have for busy people. No cute shoes? Check out this video for tips on picking the best walking shoes. Don't know where to start? Learn the keys to walking for weight loss. 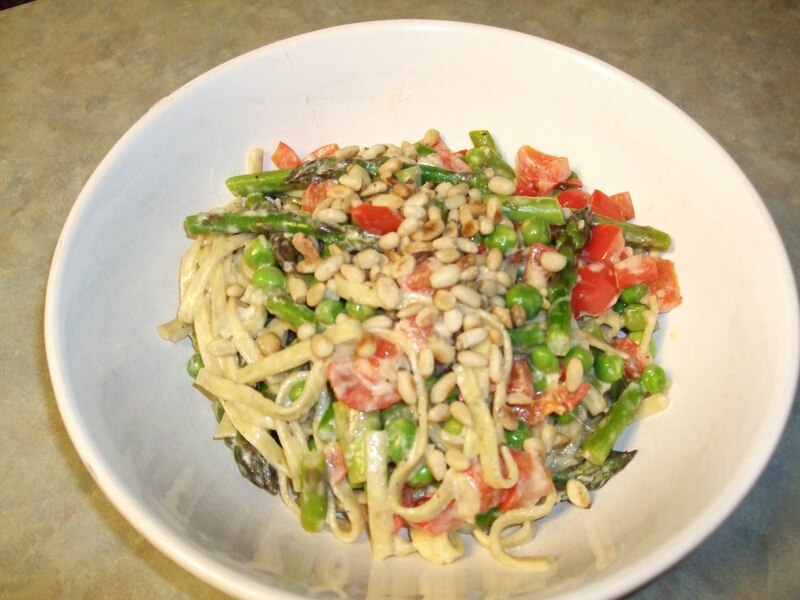 Here's a pasta dish based on two spring crops: asparagus and sweet peas. I'm not usually a fan of peas, but fresh ones from the pod are a whole different experience than the frozen peas we get most of the year. Using yogurt instead of cream cuts the fat and calories significantly, but it still tastes great. 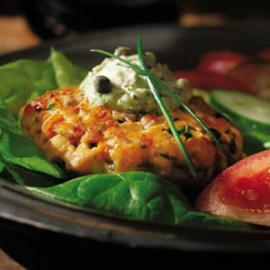 You can add bits of chicken or shrimp if you want some extra protein. We loved it as is, though. Cook pasta according to package directions. When al dente, drain and keep warm. Heat olive oil in a large skillet over medium high heat. 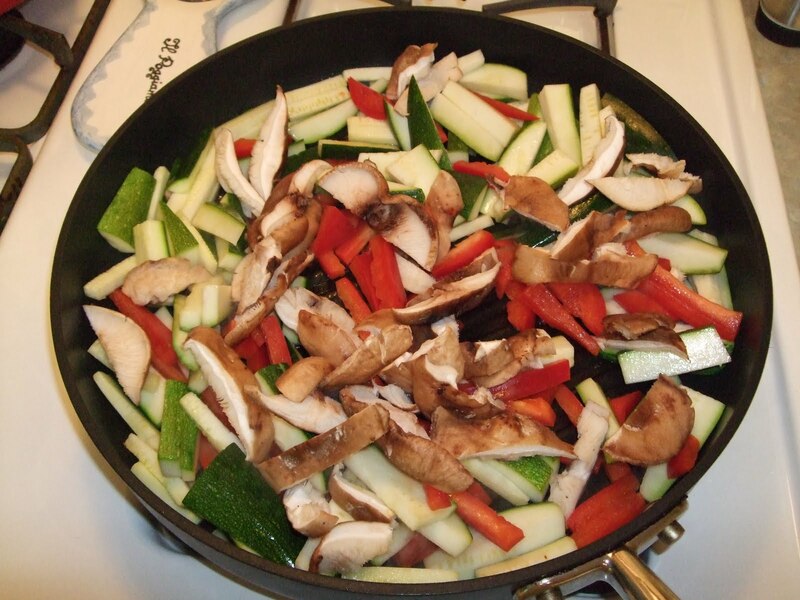 Add next 4 ingredients (bell pepper through garlic) and stir-fry until veggies are tender, about 5 minutes. In a small bowl, mix yogurt with tarragon, lemon juice, salt and pepper. Remove frying pan from heat and stir in yogurt mixture. Add pasta and toss well. Sprinkle cheese and toss again. Divide dish into serving bowls or plates and sprinkle with the pine nuts. 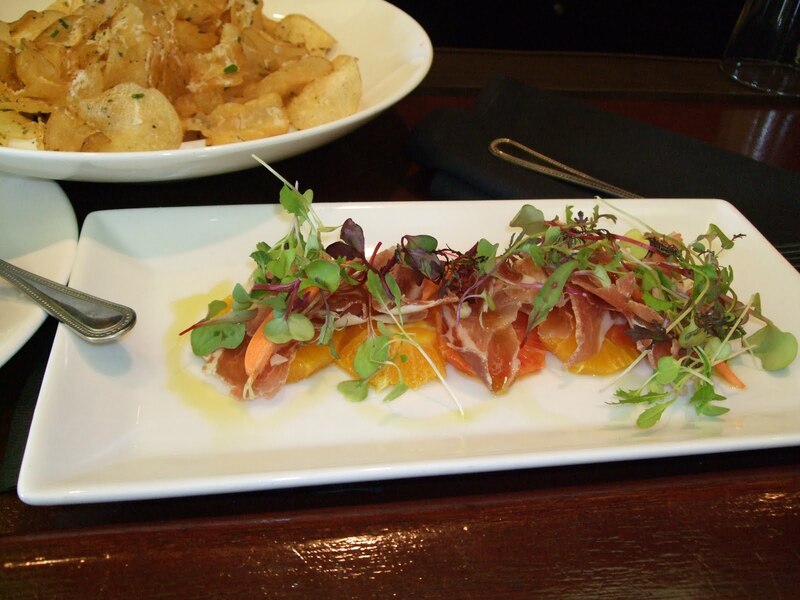 "The menu is a collection of small plates inspired by local ingredients and local farms. Menu is created around the week's harvest." 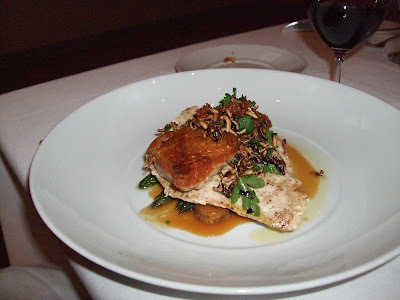 We hadn't eaten at Chalk in quite some time, and finally got back there this weekend. 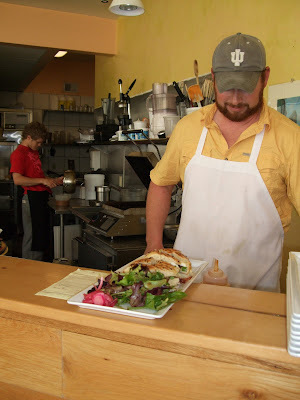 Many of the menu items say "house made" or "house cured," and words like "seasonal" and "local market" appear throughout. I also like that almost all the entrees tell the source of the main ingredient -- such as Fiedler Farms pork or Ed Hill Farm's chicken. We tried everything from the house cured ham (pictured at top) with cocktails to garlic gnocchi with spring peas, fennel and lemon balm, spring mushroom salad, arctic char over soy beans and watercress (also pictured) to the chef's tasting menu -- 3 courses with wine for $40, including the bison steak shown in the photo. PS--Yes, those are potato chips in the background of the first photo, with the house-cured ham. They brought those out with the cocktails, and we tried to minimize that indulgence.